"A triangle shaped fried appetizer famous throughout the Middle East. This is my mothers recipe for her tuna filled ones. If you can find Italian tuna packed in olive oil, this is most preferable." Melt the butter in a skillet over medium heat. Stir in the onion, and cook until the onion has softened and turned translucent, about 5 minutes. Transfer the onion to a mixing bowl, and stir in the tuna, parsley, capers, and Parmesan cheese; season to taste with salt and pepper. Cut the phyllo sheets in half lengthwise, ending up with long, narrow sheets. Lay out one strip of phyllo at a time on your work surface with one of the narrow ends close to you. Place a heaping tablespoon of filling 1 inch from the end closest to you. Fold the bottom right corner over the filling to the left edge to form a triangle. Fold the triangle up, bringing the point at the bottom left up to rest along the left edge. Turn the lower left corner over to touch the right edge. 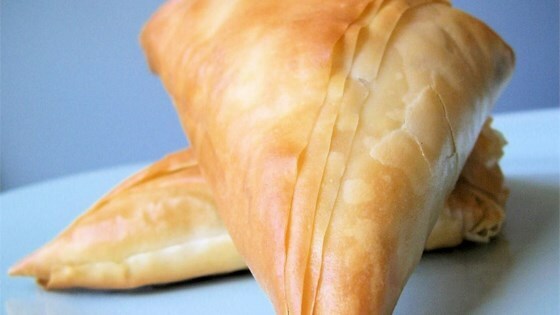 Continue turning the triangle over in this manner until you reach the end of the phyllo. Lightly brush the last inch of phyllo with water to seal. Repeat with the remaining filling and phyllo dough. Fry the brik in the preheated oil in batches until golden brown and crispy, about 3 minutes. Drain the brik on a paper towel-lined plate. Serve with lemon wedges. Learn how to make spicy tuna sushi rolls at home. In Morocco we call them Briwat. You can replace tuna with chicken, seafood or ground beef. This recipe was a huge hit at my Moroccan-themed dinner party. The recipe is phenomenal, but phyllo dough and I don't work well together. A crowd-pleaser! So unique to serve. Best part, there was a ton of tuna left and I mixed it with a tablespoon of Mayo and had a restaurant-quality tuna melt for lunch the next day.